From teaching your toddler how to ride a bike, to a family day around the pool, to needing a commercial concrete floor coating for your office or warehouse – your space is much more than just concrete. These areas can be subjected to all sorts of abuse, including weather and chemical exposure and impacts. Concrete spaces were once just dull, gray slabs that no one paid much attention to. Over the years, concrete solutions have certainly come a long way. Today, there’s a variety of options available that offer tons of colors and patterns for a true one-of-a-kind floor. How Do I Know What Concrete Coating Solution Is Best For Me? There are 4 general questions you should answer to find the concrete solution that will work best for you. Will your concrete need to withstand chemical exposure? What type of traffic will your concrete need to withstand? Is there a potential for thermal shock? Will there be heavy loads or direct impact potential? Once you have your specific needs in mind, you can start envisioning what you would like your new concrete space to look like. 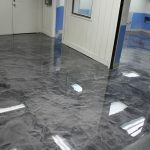 The most popular concrete solutions are staining and epoxy flooring coatings. Both applications offer great benefits, so which one is right for you? Here at Dreamcoat Flooring we want to help you discover the concrete flooring of your dreams. Let’s take a look at each of the concrete coating options we use in Phoenix and see how they compare. Staining can give your space a great look. Available in a wide variety of colors, you can customize your color to match your existing decor. 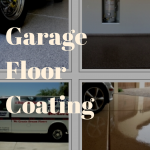 Compared to epoxy floor coatings, staining your concrete is a bit more budget friendly. It’s important to keep in mind that price isn’t the only thing you should consider. Staining won’t protect your concrete floor over time and some stains can actually damage your concrete. Epoxy coatings offer superior resistance to damages caused by abrasions, impacts, stains, and moisture. Our industrial-grade epoxy flooring solutions also offer incredible durability against weathering, UV damage, and color fading. The slightly higher up-front cost shouldn’t deter your consideration. This concrete solution can certainly save you money in the long term. Professionally installed epoxy coatings from Dreamcoat Flooring will preserve it’s beauty for decades. Our professionals are excited to show you how we can help bring out the beauty in your concrete space. 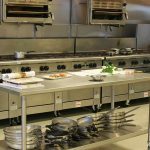 Whether you have need Commercial Kitchen Flooring Epoxy, your driveway concrete improved, or color for your patio floor– we can create the right type and color of coating for you!